The Firefly Encyclopedia of Reptiles and Amphibians covers every family, ranging from large, predatory constrictors and crocodilians to miniature tree frogs and salamanders. 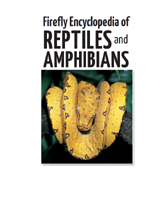 Since 2002, this highly acclaimed encyclopedia has provided specialists, educators and general readers with an authoritative and comprehensive overview of the world's reptiles and amphibians. Universally praised and cited widely in scholarly and lay publications, it belongs in all collections.